Darin grew up on a horse farm in Georgia. 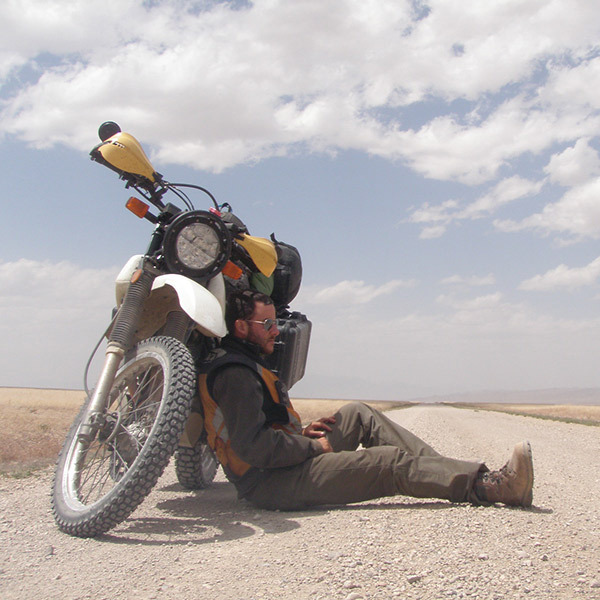 Motorcycling and travelling came from his family. He got his first motorcycle when he was 16. His dad started riding when he was 16 and his dad started riding when he was 16. Darin started working as a mechanic when he was 16. He left home when he was 18 and have been on the move ever since. Darin is hard working, optimistic and calm and collected in a tight situation. He is our "southern comfort" at MotoQuest. Quote: " ""Broad, wholesome, charitable views of men and things can not be acquired by vegetating in one little corner of the earth all one's lifetime."" - Mark Twain"
Favorite Motorcycle Experience: Riding in an ambulance, a police car, and getting mistaken for a homeless person. All in one day. Motorcycles Owned: Yamaha XJ550, Suzuki DR650, BMW R100GS. Favorite Motorcycle: All of them. Expertise: Fixing things in the middle of nowhere, fleet maintenance and operations, vehicle recovery, MIG welding, Oxy-Acetylene welding and cutting, military first aid, adult and pediatric first aid and CPR. I've worked on soviet era trucks, military tanks, generators, motorcycles, large trucks, tractors, etc. A little bit of everything. While travelling, I've lived out of a vehicle and fixed things in the middle of nowhere. Now that I work for MotoQuest, I live out of a vehicle and fix things in the middle of nowhere.